When It Does Rain in Phoenix It Can Rain! It is almost pointless to talk to someone in July when the temperature is 110 degrees about what happens in Phoenix when it rains. You want to point out how planned communities have drainage plans and retention basins, etc. The situation in the summer may be that no precipitation has been seen for months, so they wonder why you’re even bringing it up. Well, the last couple of day we’ve been drenched and now those plans and preparation are very much needed and appreciated. Meteorologists are even saying that we may see as much rainfall in this 5 day period as we saw all of last year! Yesterday there was even a tornado warning, and many roads have been closed because of flooding. The picture above is not a lake water feature for a subdivision. It may be for the time being, but actually it is a retention basin with grass in the community common area that accumualtes the runoff from storms such as the one we are having that has dumped over 3″ inches of rain in a 24 hour period in some parts of they valley. Known for setting the standard of luxurious urban living in the heart of Scottsdale, the Scottsdale Waterfront Residences are located near the intersection of Camelback and Scottdale Roads. The waterfront designation is due to the location next to the historic Arizona Canal. The SRP canal was completed in 1885 and facilitated the founding of many valley communities. In 1888, Major Winfield Scott purchased 640 acres next to the canal and Scottdale Arizona was born. The real attraction to these luxury Scottsdale condominiums is the urban living atmosphere and proximity to dining, entertainment, shopping and everything within a close commute. The Scottdale Fashion Square, the largest shopping mall in Arizona with approximately 2 million square feet of retail is just across the street. 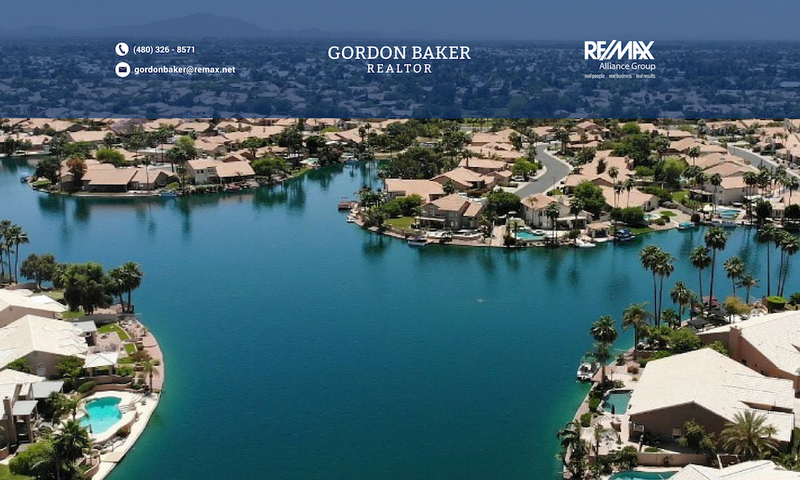 Cantabria Shores is located in south Chandler in the Ocotillo area and has some of the best views of any waterfront community in the valley. This is because of the lake and golf course combination that offers a view not characteristic of typical townhouse developments. Floor plans of these chandler townhomes for sale range from 1,100 sq.ft up to 2,217 sq.ft with a 1 or 2 car garage and include single and two story designs. As late as 2007, larger townhouses sold for over $400K.